Back in Paris and I was sick of the cold. The weather just couldn’t make up its mind whether it felt like snowing, torrential rain or the constant grey drizzle. Tonight it was just torrential rain with episodic hailstones thrown in for good measure. I decided that there was only one thing for it: choose a restaurant that makes me think of summer. 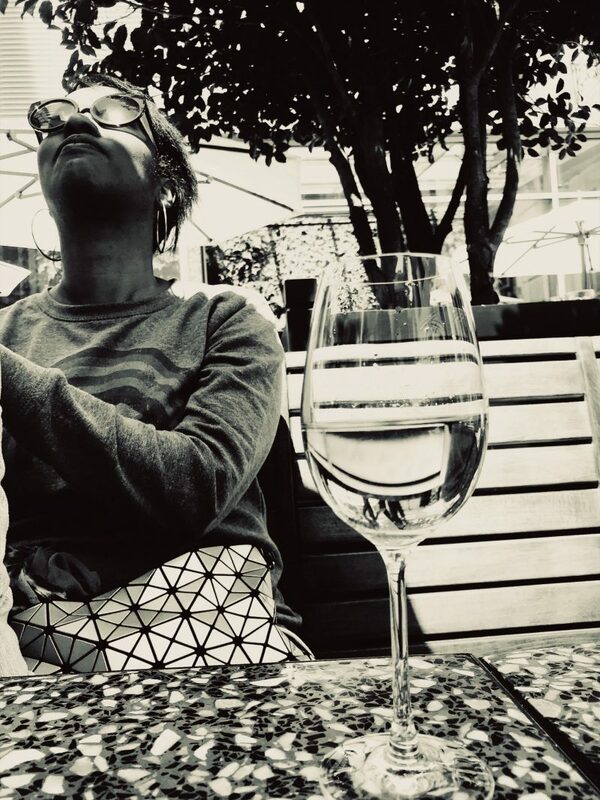 I eat pizza in the summer preferably on a terrace with a nice cold glass of white wine in Italy. Where to find that in Paris. I knew exactly the place! I had stumbled across on one of my walks in Paris. Piccoli Cugini which is literally a hop and skip away from Canal St Martin. I didn’t make a reservation and although it is small inside. The waiter was happy to let me have my pick of a table. There was no issue that I was alone. He made me feel really comfortable with a big smile. The menu is not very long, there was pizzas with a tomato base or just plain: pizza bianco. When I go back I will be having a pizza bianco. Everything on the menu is made fresh and the pizza base is just to die for, thin but not too crispy. 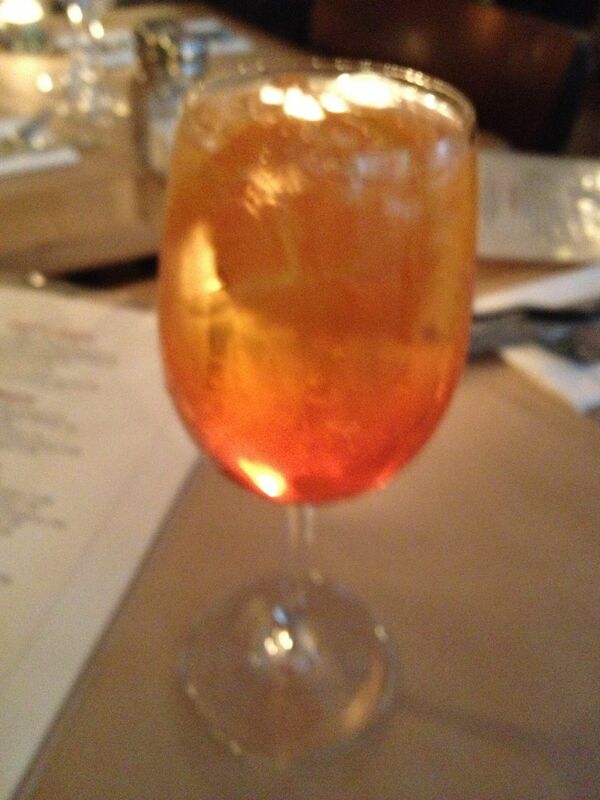 I settled into my evening by ordering a Spritz. A cocktail made with aperol (an Italian liquor which is slightly bitter), oranges and bubbles. I hesitate to say champagne but some sort of fizzy wine. Imagine drinking this on a hot summer’s evening, very refreshing and livens up the tastebuds for the food to follow. The restaurant started to get busy but no one stared at me. I wasn’t rushed and was able to sit and observe. 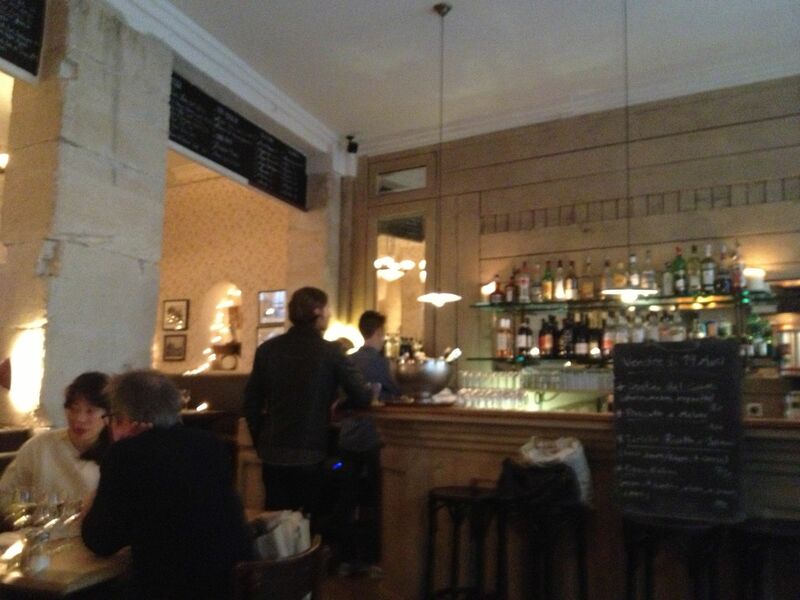 As with most Parisian restaurants, you are in very close contact with neighbouring tables. So I could listen in on conversations as well, although the couple next to me were not very talkative. The decor is sort of rough luxe; naked lightbulbs, book shelf on the back wall all very well done and hip. The kitchen opens up into the restaurant so that you can see your food being prepared by the female chef. Italian voices can be heard which is always a good sign. 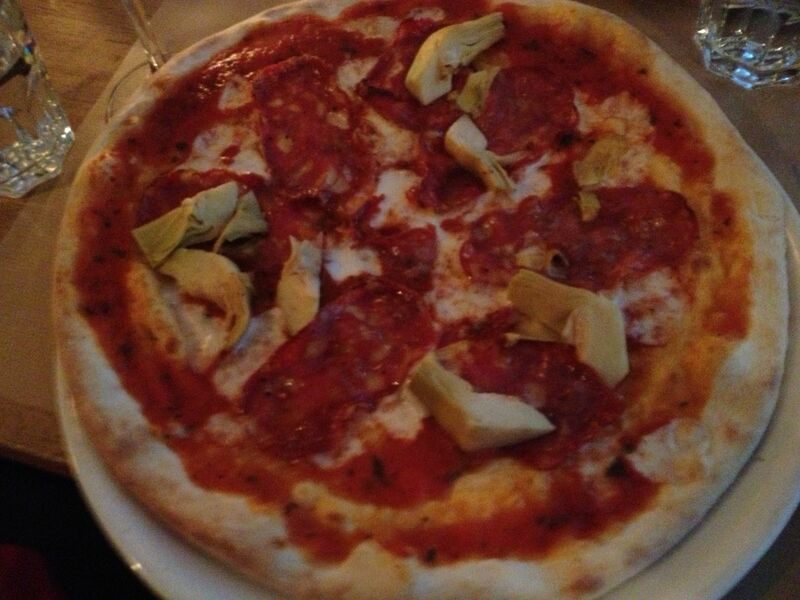 I finally chose a pizza rosa (which uses tomato sauce on the base) with Italian ham and artichokes. Usually I eat slowly so as to savour the flavour. However, tonight I couldn’t help myself and I ate my pizza in record time. It was almost blink and there it was and not it’s in my stomach. It was absolutely delicious. The dough was not too chewy and the sauce not so overpowering or copious as to drown out the other toppings. At €13,50 a pizza it is not very expensive. Given the size of the pizza which filled the entire plate. I could not manage a dessert but I did settle for a small decaf coffee. 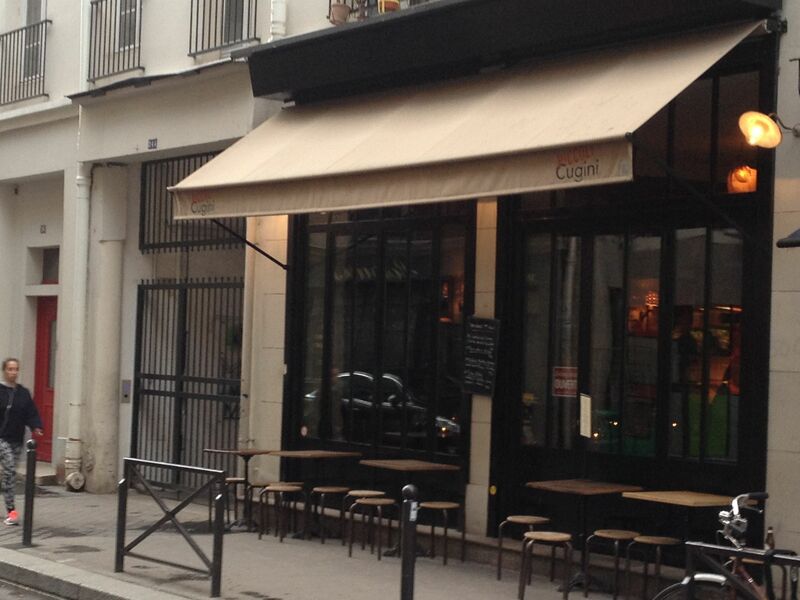 I will definitely be heading back to Piccoli Cugini when I need a pizza fix in Paris. This is the real deal, authentic and freshly made. The good news is that you can also order the pizzas to go!